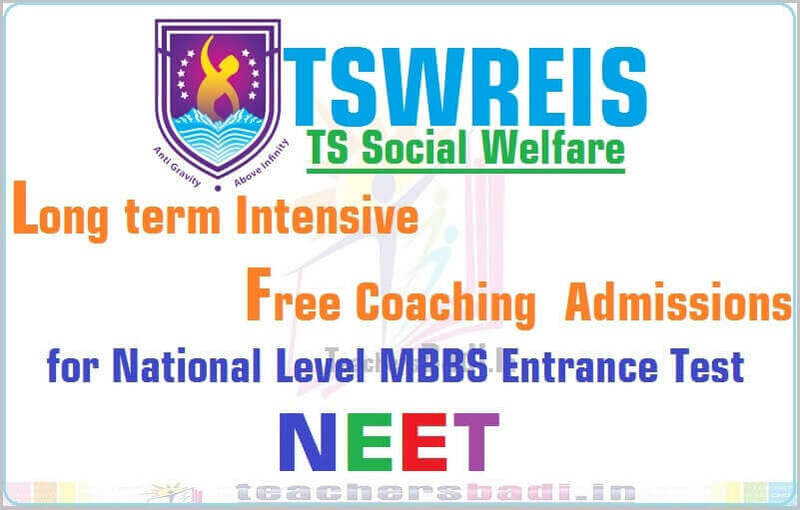 #NEET #freecoaching, TSWREIS Long term NEET 2019 Free Coaching Admissions 2018: TSWREIS NEET Free Coaching 2018, National Level MBBS Entrance Test 2018 Free Coaching, Long Term Free Coaching Admissions 2018, TS Social Welfare Online Application Form, Long term NEET-2018 Free Coaching Admissions Application Form: Telangana Social Welfare Residential Educational Institutions Society(TSWREIS) has published the Long Term Intensive Coaching 2018 notification for National Level MBBS Entrance Test NEET 2019 and applications are invited from Boys and Girls for admissions into Long term coaching for NEET at TSWRS/JC (G), Gowlidoddi, Ranga Reddy District for the academic year 2018-2019. Telangana Social Welfare Residential Educational Institutions Society(TSWREIS) Hyderabad: Admission into Long term Intensive Coaching for National level MBBS Entrance i.e. NEET 2019 for the academic year 2018-2019. Applications are invited from Boys and Girls for admission into Long term coaching (OPBC) in Medical stream to appear NEET-2018 at TSWR IIT/Medical Academy (Girls), Gowlidoddi, Ranga Reddy District for the academic year 2018-2018. The following are the instructions to apply for admission. హైద‌రాబాద్‌లోని సోష‌ల్ వెల్ఫేర్ రెసిడెన్షియ‌ల్ ఎడ్యుకేష‌న‌ల్ ఇన్‌స్టిట్యూష‌న్స్ సొసైటీ (టీఎస్‌డ‌బ్ల్యూఆర్ఈఐఎస్‌) నీట్ -2019 ఒక ఏడాది లాంగ్ టెర్మ్ కోచింగ్ కోసం ఎస్సీ విద్యార్థుల నుంచి ద‌ర‌ఖాస్తులు కోరుతోంది. అర్హ‌త: టీఎస్ ఎంసెట్‌లో 80 మార్కులు లేదా నీట్-2018లో 250 మార్కులు సాధించిన విద్యార్థులు అర్హులు. అభ్య‌ర్థుల త‌ల్లిదండ్రుల వార్షికాదాయం 2 ల‌క్ష‌లకు మించ‌కూడ‌దు. పూర్తివివరాలు: ఈ ప్ర‌క‌ట‌న‌కు సంబంధించిన మ‌రింత స‌మాచారం సంస్థ అధికారిక వెబ్‌సైట్‌లో 15.06.2018 నుంచి అందుబాటులో ఉంటుంది. 1. Only students, who belong to SC community, can apply (Latest caste Certificate issued by the Tahasildar concerned).Only students, who belong to SC community, can apply (Latest caste Certificate issued by the Tahasildar concerned). 2. Only the students who passed IPE in March 2018 are eligible. 3. The applicant should have minimum 90% in optionals i.e., Botany, Zoology, Physics and Chemistry to apply. 4. The student must have scored 80 Marks and above in EAMCET 2018 (Conducted by Government of Telangana) (to select under 30% quota). 5. The student must have scored 250 Marks and above in NEET 2018 (to select under 70% quota). 7. The total number of students intake is 80 only. TSWR IIT/Medical Academy (Girls), Gowlidoddi, Ranga Reddy District. 1. The students will be selected on merit basis i.e., The student must have scored 80 Marks and above in EAMCET 2018 (Conducted by Government of Telangana) (to select under 30% quota). The student must have scored 250 Marks and above in NEET 2018 (to select under 70% quota). So, the students will be selected purely on merit of NEET-17 and EAMCET-17 marks i.e., 70 : 30 (70% students will be taken from NEET-2018 marks and 30% students will be taken from EAMCET-2018 marks). 1. The applicant should submit his/her application through on-line our website :www.tswreis.telangana.gov.in / website : www.tswreis.in. 2. On-line application will start from 15.06.2018. Venue of the Coaching: TSWR COE Gowlidoddi, Ranga Reddy District. will be taken from EAMCET-2018 marks).